Found one file extension association related to Advanced Encryption Package and 1 file format developed specifically for use with Advanced Encryption Package. Developer / company: InterCrypto Ltd.
Advanced Encryption Package Professional - award-winning easy-to-use file encryption software for Windows 7, Vista, XP. Easy to use for novices. It integrates nicely with Windows Explorer and made easy for novices. 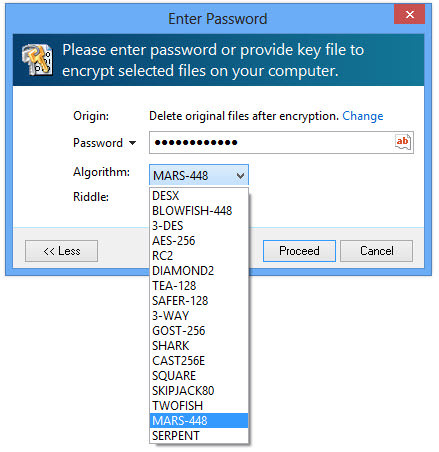 Strong and proven algorithms to protect your sensitive documents (20 encryption algorithms). Symmetric and asymmetric algorithms (17 data destruction algorithms). Using USB flash drives to store [en]-decryption keys. Creating encrypted self-extracting file to send it as email attachement. No additional software is required on other end! Complete command line support to fully automate [en]-decryption tasks. If you need more information please contact the developers of Advanced Encryption Package (InterCrypto Ltd.), or check out their product website.